Wisterias are twining climbers that have large, drooping clusters of scented flowers. The flowers come in shades of white, blue, purple and pink. This climber is fast growing and perfect for training over pergolas, walls or into trees. They flower from April to June depending on the variety and make a lovely addition of height, structure and colour to the spring garden. They often also feature attractive bean-like pods after flowering. 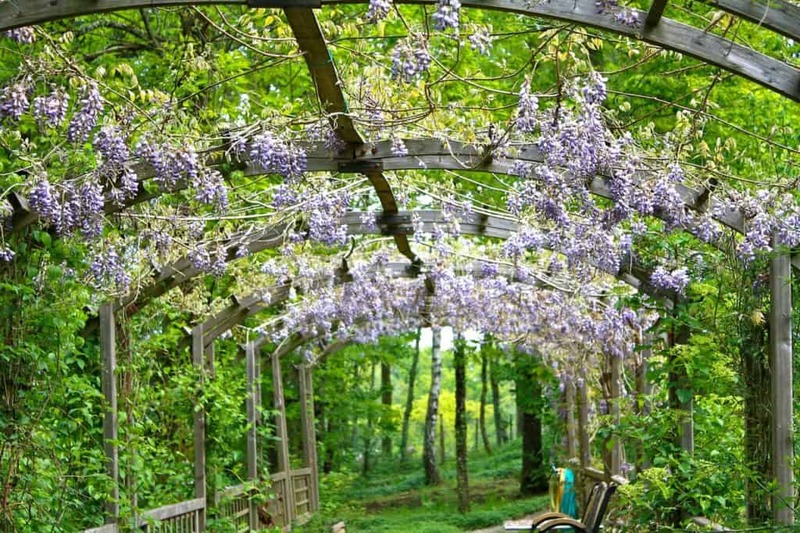 This article will cover how to choose the best variety of wisteria for your garden. It will also detail how to care for your plant, how to propagate it and how to deal with any problems that may arise. Wisteria is very hardy and can tolerate temperatures well into the minuses. Late sub-zero temperatures can sometimes affect flowering buds. Wisteria is a deciduous climber. The most commonly used species are W. floribunda (Japanese wisteria), W. sinensis (Chinese wisteria) and W. brachybotrys (silky wisteria). There are also many cultivars of these species. All three species are hardy, strong and fast growing. They can reach a height of up to 10 metres (30 feet) when grown up a tree, or a spread of 20 metres (60 feet when grown over a wall or other structure. Most varieties flower in spring though they may occasionally have a second flush of flowers in late summer. Wisteria sinensis produces spectacular flowers in May and June before the leaves appear meaning they are clearly visible and not masked by foliage. Its flowers tend to open simultaneously, providing a spectacular display. It has stems that twine anti-clockwise and is a good choice for growing against a wall where is short racemes (flower clusters) appear at their best advantage. Here are some of the best cultivars to grow. ‘Burford’ has clusters of flowers up to 10 cm in length. 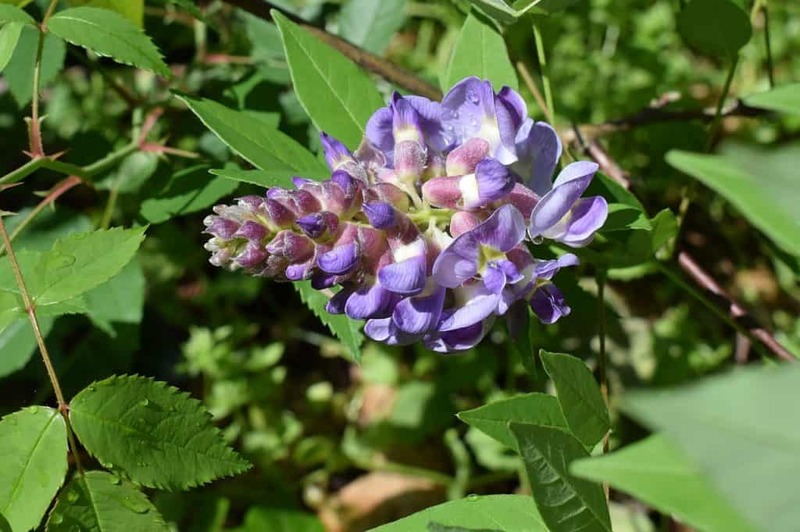 Its pea-shaped blooms are shades of purple, lavender and white with a yellow spot at the throat. The abundant blooms have a sweet scent and attract butterflies and bees. ‘Alba’ is a stunning variety that features racemes of up to 60 cm in length. The flowers are white, tinged with lilac, and deliciously scented. ‘Domino’ has highly scented lilac-blue flowers in clusters of 20 cm long. ‘Rosea’ is a beautiful rose-coloured variety that has racemes of 60 cm in length. ‘Royal Purple’ This is one of the darkest purple varieties and has flower clusters of up to 60 cm. ‘Show-beni’ has lilac pink, scented flowers in hanging sprays up to 15 cm long. It also features velvety seed pods of up to 20 cm. ‘Prolific’ is an outstanding example of this variety bearing an abundance of blue-violet flowers in clusters of 30 cm long. ‘Amethyst’ has heavy clusters of violet flowers up to 30 cm. The leaves emerge a dark bronze. This variety also tends to flower from a young age. A further variety, Wisteria frutescens ‘Amethyst Falls’, is a more compact species from North America that reaches only 5 metres, making it perfect for small gardens or growing in containers. It has clusters of lilac-blue flowers. When choosing a wisteria for your garden look for one that has been grown from cutting or grafting. This will provide you with a reliable plant that should flower well. You can tell a grafted plant by the bulge near the base of the stem where the plant has been grafted onto a rootstock. Make sure that the graft union is well callused over and does not show signs of splitting or decay. Check too that there are no suckers coming from the rootstock. Your plant will flower best in full sun; however, most varieties can cope with a little shade. These plants can quickly dry out, especially if planted in sandy soil. Keep an eye on them and water in dry weather, particularly in their first year. These plants prefer well-drained fertile soil. They do not like to sit in heavy, waterlogged soil, so do ensure adequate drainage. Wisterias should be fed in the spring with a shrub fertiliser or fish, blood and bone. If your soil is sandy you may also need to apply sulphate of potash to increase potassium levels. If your soil is poor, add some compost, soil improver or well-rotted manure. Dig a hole a little deeper than the root ball and twice as wide. If you are planting more than one wisteria, then allow 3 metres (10 feet) between them unless you have chosen a more compact variety in which case they can be planted slightly closer together. Position you plant level with the soil if it is a grafted specimen ensure the graft area is not in contact with the soil. Backfill and firm in the soil before watering well. To keep your wisteria in good health, water it well if it receives less than an inch of rain in a week. Mulch the area beneath your plant each spring to suppress weeds and help retain moisture. Ensure the mulch does not touch the stem to reduce the risk of rotting. If growing your plant in a container choose a suitable compact variety such as Wisteria frutescens ‘Amethyst Falls’. Plant in a good quality potting compost in a pot slightly larger than the rootball. Place some crocks over the drainage holes to prevent them from becoming blocked. Put your plant in the container and cover with compost. You will also need to provide a tall sturdy support for your plant. Firm in and water well. Your container grown plant will need regular feeding with a fertiliser tailored for flowering plants. You will also need to prune your plant to create a desirable structure. See pruning advice below. Water your plant regularly but not so often that the plant sits in soggy soil. You should repot your plant when the roots become overcrowded. Choose a pot slightly larger than the rootball. Wisteria looks good in a traditional cottage garden with other cottage plants and climbers. It also works well in a Japanese or Zen garden, especially if grown in a container and shaped well. Growing another climber, such as clematis Montana, through your wisteria can give you double the beauty of growing this plant alone. You can also choose to grow later flowering climbers through your wisteria to extend the period of colour you enjoy. It is essential to prune wisteria correctly to ensure good flowering. The plants will flower more abundantly if pruned twice a year in summer and winter. Pruning provides good air circulation within the plant and allows sunlight to reach the new growth. In July or August, after flowering cut back the new growth to five or six leaves per stem. This will control the size of your plant and encourage it to form flower buds rather than excessive foliage. In January or February, cut back the growth to two or three buds per stem. If you have a wisteria that is overgrown and not flowering well, then you can undertake some renovation pruning. Shorten long branches back to a new growth shoot. Remove older stems back to a main branch or even to ground level. It can be hard to prune the entangled growth of this climber but you are aiming for a framework or well-spaced branches. You can also remove some of the flowering clusters when they appear, to encourage the development of the remaining flowers. Container grown plants will require initial pruning to develop a good structure. Start with a single stemmed plant and plant in the container with a good support. You will train the plant up this support to create a sort of tree-like canopy that will allow the flowers to droop down below. Allow the main shoot to grow up this support before removing the growth tip. Prune the side shoots the following winter to 15-30cm (6-12 inches) and repeat every winter to gradually build up a head. While wisteria can be propagated from seed they can take up to 20 years to flower when grown this way. Professionals usually propagate by grafting; however, layering is probably the easiest method for the home gardener. Layering can be done in autumn or spring. Choose a strong, health non-flowering shoot that is low growing and can reach the soil surface easily. Make a cut at the underside of the stem at a leaf joint. Do not cut more than halfway through the stem. You may like to apply hormone rooting powder to the cut, but this is not usually necessary. At the point where the stem reaches the soil, dig a hole about 5cm (2 inches) deep. If the soil is heavy, add some grit, if poor, add some compost. Peg the stem down with a sturdy forked twig or bent wire. Water well. Cover the section with more compost and firm well. Place a cane into the ground near the end of the stem and tie the stem to the cane to keep it off the ground. If the plant was layered in spring it should be ready to cut from the parent plant by autumn. It can then be potted up and kept in a sheltered spot over winter for planting out the following spring. Wisteria is generally a tough climber that can cope with most pests that come its way. Problems are likely to arise only if conditions are not ideal for your plant, such as waterlogged soil. Good care should prevent most diseases and there are few pests that cause many problems for the plant. 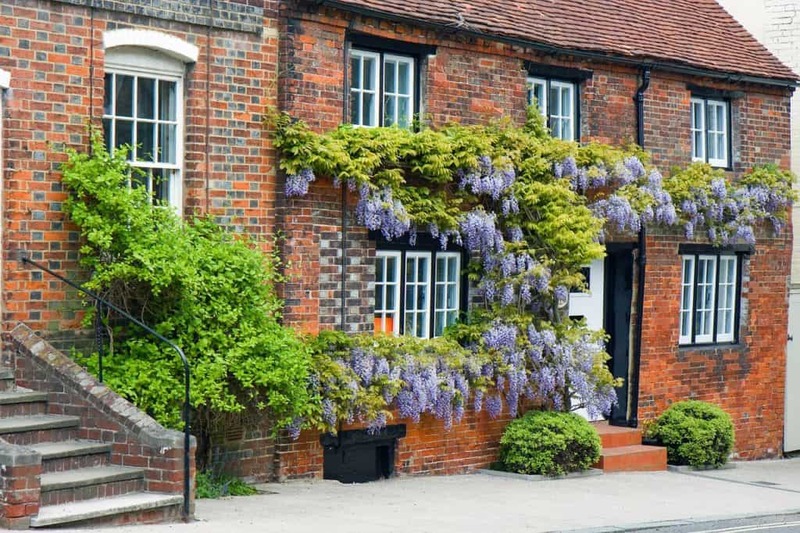 A recently occurring pest is wisteria scale, however, this is still rare and mainly confined to London and surrounding areas. Wisteria scale is larger than other types of scale and can be up to 10mm. The mature insects cover themselves with a waxy substance that is blackish brown. They are circular in shape. Check that the insect is wisteria scale before treating. If it is brown scale it won’t really affect your plant so much and can usually be left alone. If you do have this pest it can be treated with pesticides but do not apply these during flowering as they can harm pollinating insects. The newly hatched scale insects are more vulnerable to pesticides and appear in late May to June. Treating these will break the life cycle of these pests. Phytophthora are microscopic fungus-like organisms that can cause damage to the roots and stem base of your plant. It is largely a problem in waterlogged soils and improving drainage can drastically reduce the likelihood of it occurring. Plants that have been affected should be removed and destroyed along with the surrounding topsoil. These organisms can survive in soil without a host plant so if you have lost a plant to this disease you should replace it with something that is resistant to it. If your plant is affected by honey fungus you may see bark that is cracking due to the pressure of the fungus growing beneath it. If you peel back some of the bark you may see white sheets of the fungus. Occasionally you may find yellow toadstools growing at the base of your plant in late summer or early autumn. Unfortunately, the damage done by this plant mostly occurs underground. The rhizomorphs feed on your plant but can also spread through the soil at a rate of up to 1 metre a year. Unfortunately, the only way to get rid of this fungus is to destroy the plant and remove every trace of it. This will mean the fungus has nothing on which to feed. Leaving the plant in the ground increases the likelihood of the fungus spreading to other plants in your garden so do not delay. Replace the plant with something that is resistant to the disease. Q I have had a wisteria for five years, but it only produces occasional blooms. How can I make it flower more abundantly? There are a few possible reasons why your plant is not flowering well. Firstly, it may not be getting enough sun: wisteria really does need plenty of sunshine to flower well. It’s also a good idea to check that you are pruning your plant correctly. Good pruning can encourage flowering, however, pruning in early or mid-summer can impact on the production of next years flower bud. Watering can also affect flowering. The flower buds for the following year develop between July and September. If your plant does not receive enough water at these times it may not be able to produce many flower buds. The final possible cause is that your soil is poor. If the other remedies do not work, you may like to try adding sulphate of potash in spring to increase the potassium levels in the soil. Q My wisteria was healthy, with plenty of flowers and new growth but now it is wilting and dying. What could have gone wrong? Wisteria does occasionally die rather suddenly. There are several possible causes. If the plant is in a container or wet soil, then it may be that the roots have rotted meaning the plant can’t take up enough water and nutrients to sustain it. Another possible cause of your plant’s demise is a disease such as honey fungus. If you see evidence of honey fungus you should remove the plant completely and dispose of all plant material to prevent the spread of the spores. However, perhaps the most likely cause is that your plant has suffered graft failure. When this happens, the flow of water and nutrients from the roots stock to the grafted top growth is interrupted leading to the sickness and death of the plant. Though graft failure is not always clearly visible, you may see a separation between the rootstock and scion. The rootstock may still be healthy and will produce suckers. In future, you should check any grafted plants that you buy are healthy, strong specimens. Inspect the graft union carefully and do not buy plants that show signs of decay or suckers coming from the rootstock. The graft union should be neat and well joined with no signs of splitting or separation. In addition, ensure that you do not damage the union during transport, planting or by strimming or mowing too close. When planting, the graft should be above the soil level and mulches should not be applied too close to the stem.